When you're trying to get fit, or lose that unwanted weight, nothing is quite as frustrating as seeing your results go flat. This is a common place where many people end up, usually after a few months on the same exercise routine. In the beginning your body responds well to your routine with lost pounds and gained muscle tone, then one day all your hard earned results screech to a sudden stop. Why does this happen? And, more importantly, how can you prevent it from happening? Is this you or someone you know? It's a common occurance. Let's see why this happens. To start, your muscles adapt quickly to any repetitive routine. Remember that the definition of 'insanity' is to do the same thing over and over while expecting different results. This holds true for your workouts. When your results stop, it's time to change your routine. Believe it or not your body is pretty smart, and what's happened is your muscles have adapted to your routine. So what do you do? Simple, it's time to change your routine and confuse your muscle so it starts from scratch and you start regain the results you want. Let me offer 4 ways to move your workouts up a notch or two so you can start enjoying the results you've been accustomed to. Drop sets are often used to fight off exercise plateaus. This technique is great for increasing muscle strength, endurance and for adding to the cardiovascular benefit of your workout,which ultimately results in more fat burn. Sand Bag Squat Jumps: With feet wider than shoulder-width apart hold a sand bag at chest level. Squat down until your knees are at a 90 degree angle. Explosively jump up, raising the sand bag straight over your head. If you'd like some help with these programs or simply need help breaking through your fitness plateau, contact me and I'll be happy to help. Here's another thought to help you as you go through your plateaus, remember to find your motivation to be fit. Motivation comes from having a goal. What is your goal? Why do you want to get into great shape? Take a minute to really uncover the reason that you want to lose the weight. Don't say something vague like you want to 'Be thinner' or 'Look more attractive.' Dig deeper - there is a very specific motivator in your life, you simply need to uncover it. When you do it's like opening the "Pandora's Box" and all of the riches pour out. Whatever motivates you, find it and use it to be all you want to be. You can do it, and remember you're not alone. Thats why I'm here, don't be afraid to contact. I love desserts, and dessert doesn't have to be unhealthy to taste great. 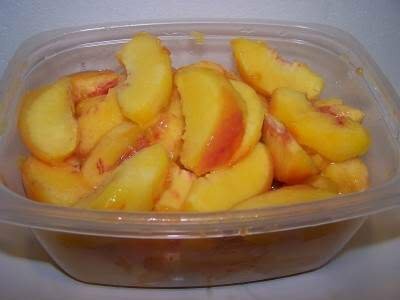 This recipe makes a great healthy peach cobbler, that I think you'll enjoy. I used peaches, but feel free to substitute with apples or pears. Traditional cobblers and pies are filled with fat and sugar; but this recipe is much lighter, and will satisfy your sweet tooth just as well. Wash, peel and pit the peach. Chop into bite-sized pieces. Pre-heat a skillet over medium-high heat. Spray lightly with coconut cooking spray. Saute the peach pieces for about a minute, then add the agave nectar, salt and cinnamon. Continue to saute for another few minutes until it turns a deep golden color. Serve and enjoy immediately! Nutrition: One serving equals: 53 calories, .2g fat, 100mg sodium, 13g carbohydrate, 1.8g fiber, and 1g protein.